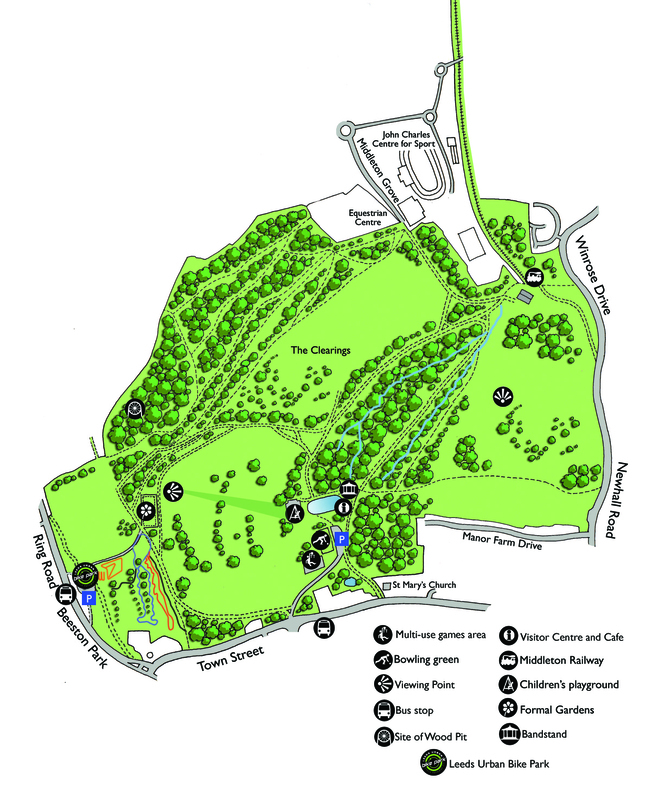 Middleton Park is situated 4 miles from the City Centre in urban South Leeds. Of its 630 acres, 200 are ancient woodland, and there are also grasslands, two bowling greens, a children's play area and other recreational areas. Unfortunately the Golf Course closed in 2014. There is a Visitor Centre with a cafe - the opening times are on our homepage . The Park does not have an official postcode, but directions to the main entrance on Town Street can be found by using the postcode LS10 3SH in SatNavs, etc. Middleton Park belongs to Wade's Charity and is leased to Leeds City Council on a 999 year lease. General responsibility for the upkeep and maintenance of the park and woodlands rests with the city council. As well as its rich natural history, Middleton also has a fascinating local history including early coal mining and the Middleton Railway. The world's oldest working railway, founded in 1758, was once used for transporting coal and still carries passengers between Hunslet and a halt on the edge of the ancient woodlands. The bowl-shaped pits you will see in the woods are the remains of an early form of coal mining dating back to at least the 1660's. Over 270 of these pits have been found in Middleton Woods! Two areas of the park have been designated a Scheduled Ancient Monument due to the presence of these historic coal mining remains, and a community archaeology project to record and understand the archaeology of the area is underway. Directions to the main entrance on Town Street, Middleton, can be found by using the postcode LS10 3SH in SatNavs, etc. The following map shows the location of Middleton Park. You can zoom in or out by clicking on the "+" and "-" buttons (top left of map), and move the map using the adjacent arrow buttons or by "grabbing" and dragging the map with your mouse cursor (hold down your left-hand mouse button when your cursor is over the map to "grab" it). You start in "Map" mode, but if you click on "Satellite" (top right of map) you'll see an aerial view of the park. Clicking on "Hybrid" will show an aerial view with an overlaid map to show you the road names. Note: If you can't see a map in the space above, your web browser may be too old to support Google Maps. Currently supported browsers include IE 6.0+, Firefox 0.8+, Safari 1.2.4+, Netscape 7.1+, Mozilla 1.4+, Opera 8.02+. Middleton Park is an important historic area with nationally important Early Mining Remains. It is so important that the park has been designated a Scheduled Ancient Monument by English Heritage . This effectively means that the historic mining remains are protected by law. It is an offense to dig, disturb or damage the mining remains in the protected areas in the park. You can download a PDF document, showing the protected areas here . In general we would ask everyone to respect everywhere in the park, and to refrain from any digging.